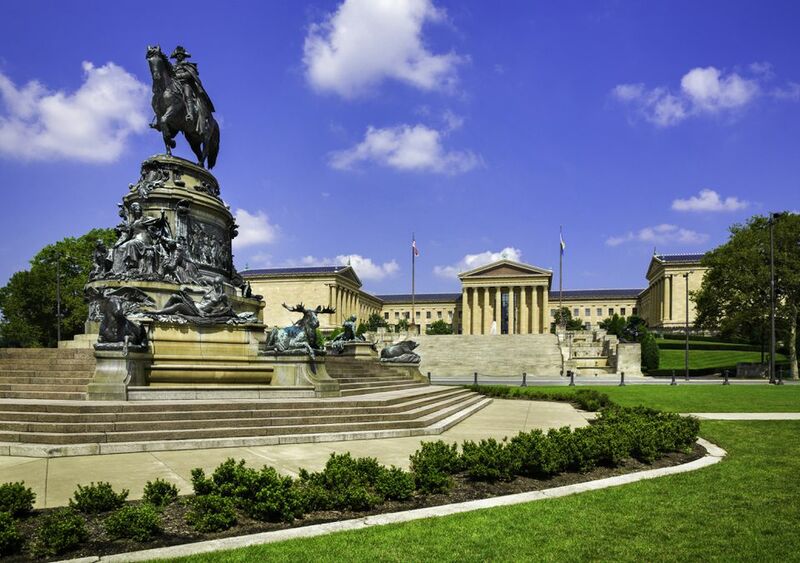 Springtime is the perfect time to visit Philadelphia. Planning your trip for some time between March and May visit is the best way to avoid both the frigid, often snowy winters that the city experiences, and the tourist rush that can take over the city’s attractions in the summer. A springtime visit also means that the weather is next to perfect and the parks are in full bloom, making casual walks around the city that much prettier. Philadelphia experiences all four seasons pretty keenly. Summers can get blisteringly hot, while winters are often at or below freezing and the best weather is usually in the Spring or fall months. Spring and even summer, can be especially pretty in Philly because many of the parks have flowering trees, such as cherry blossoms which can make walking around this time of year especially charming. Similarly, fall brings the changing of leaves, which can also make for a beautiful, if occasionally brisk walk. Fall has its own charm as the leaves begin to turn colors, which is especially beautiful if you plan to get outside of town a bit for a drive through the surrounding Pennsylvania countryside. Summer is the busiest time in the city in terms of visitors. Many of the attractions in town fill up with history buffs and families looking for educational places to visit with children who are off from school this time of year. There’s rarely an issue of not being able to get into attractions, however the lines may take a while at popular attractions like the Liberty Bell. The number of people may also affect the experience at locations like the Philadelphia Museum of Art, where a crowded gallery may make it difficult to spend quality time with a particular piece of art you admire. Philly has several annual festivals that are not to be missed. St. Patrick’s Day is a big deal here and is celebrated with a downtown parade as well as smaller events around town. The city is also home to the largest indoor flower show in the world. Several food festivals happen here every year, including Philly Beer Week, the South 9th Street Italian Market Festival and the brand-new Philly Wine Week. However, by far the most popular Philadelphia festivals are the Mummers Parade, which happens every New Year’s Day and the Fourth of July festival, which in Philadelphia, lasts for five days. This is definitely a city that loves its sports teams, so if you’re a sports fan yourself, you might want to consider making a trip to the city to coincide with the season for your sport of choice. The Philadelphia football team, the Eagles, for instance, play home games at Lincoln Financial Field from September to December, while the basketball team the 76ers, play from October to April at Wells Fargo Center. Baseball fans can catch a Phillies home game at Citizens Bank Park from March to October. March through May is the best time to visit Philadelphia. The weather this time of year is beautiful, ranging between 40 and 60 degrees on average. This is a much less busy time of year in terms of tourists so room rates are reasonable and there aren’t as many crowds in the popular attractions. The Philadelphia St. Patrick’s Day Parade is one of the biggest celebrations in the city. The Philadelphia Flower Show lasts from late April to early march. Philly Wine Week is a fairly new addition to Philly's festival circuit and lasts the first week of April. Summer is the high season in Philadelphia with lots of tourists, especially families visiting the attractions here. The weather can get hot with average temperatures from 70 to 90 degrees. Because of the influx of tourists this time of year, hotel rates are usually higher. Popular attractions can also get a little crowded. Philadelphia’s Pride Parade happens in June and a ticketed festival starts as soon as the parade ends. Dozens of performers come to town in late July for the Xponential Music Festival. Listen to live music, watch fireworks and more at the Fourth of July Celebration. September to November is also a nice time to visit Philadelphia as the changing colors of the leaves and cooling temperatures can make for great walks in the city’s many parks. The weather this time of year can be a bit brisk, especially in the later months, generally ranging between 50 and 70 degrees. This less busy time of year is a great time to snag nicer hotels at more reasonable rates and visiting popular attractions becomes less hectic. The Philadelphia Marathon is held in late November. Celebrate Philadelphia's art scene at Old City Festival in October. There will be plenty of festivals in September for Philly Oktoberfest. Winter in Philadelphia can get really cold. The weather between December and February can range from 40s to the 20s. Still, if you bundle up, most of the attractions in town are still open during this time and the room rates are at an annual low. If you’re willing to brave the cold you may find that you have many locations, particularly outdoor ones, all to yourself. Ring in the New Year at the iconic Mummers Parade. See the Christmas Light Show at Macy’s from Thanksgiving through New Year's Day.